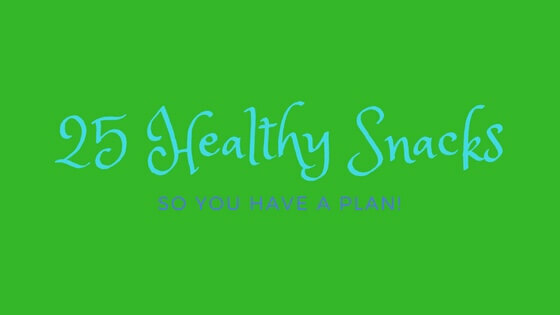 First of all if you want to succeed in your weight loss journey it’s vital that you plan. Not just meals but snacks too. It’s way too easy to grab something out of the vending machine at work or run through the drive thru for an order of fries, or grab something off the shelf at the gas station. Healthy snacks are just as important as healthy meals. A perfect snack is a combination of both carbohydrates and protein. This combination is going to give you a longer lasting amount of energy until your next meal therefore keeping you much more satisfied. In addition, protein takes more energy to digest so you are burning calories while your body is working to digest it. Every snack doesn’t have to have this make up but it’s something to keep in mind when planning out the snacks you will eat for the week. Almost all of us need work on this, the struggle is real, even for me. Sometimes I really get in a rut…what are we going to have for snacks? Having ideas on hand is so important so you can plan your week ahead, just like your meals. It’s what’s going to help you succeed! This list should rock your healthy world because it is full of healthy snacks. You have plenty to choose from, try and see what you like so you can put it on your “it’s a keeper” list. Include these types of snacks into your diet as much as possible vs. the “junky” stuff. Would love to know your healthy go-to snacks, drop me a comment below.